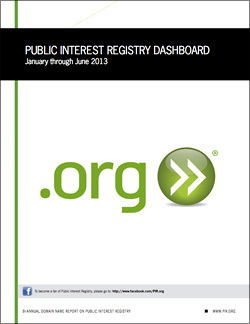 Public Interest Registry — the not-for-profit operator of the .ORG domain — today released the results of its bi-annual domain name report, "The Dashboard," detailing the international and domestic growth of .ORG from January to July 2013. Specifically, the report revealed that new .ORG registrations increased by 13.6 percent in the first half of 2013. • .ORG has reached 10.3 million domains under management (DUM) representing a net gain of 206,170 new DUM for the first half of 2013, which is an average of 34,361 new DUM per month for a 2% increase. • Strong growth in key international markets — specifically in India, who jumped into the top 10 market for .ORG for the first time. • .ORG DUM has increased by 86.8 percent since 2007. Domains Under Management – by June 2013, approximately 10.3 million organizations and individuals held .ORG domain registrations, reflecting a 2 percent increase over six months and a 3 percent increase over twelve months.Additionally, over the past year, Public Interest Registry conducted a comprehensive international research study on the overall awareness of the .ORG and .NGO/.ONG top-level domains. This study was conducted in key markets including the United States, United Kingdom, Germany, France, Brazil and India. The research found that in India, .ORG has surged as a top-level domain in the past four years with domains under management jumping from just 91,000 to nearly 150,000, a 60 percent increase. While other markets also showed steady growth for .ORG, there were a few notable misconceptions about the top-level domain as well as a lack of familiarity in select markets. For example, in Brazil, 66 percent of respondents are incorrectly under the assumption that there is certain criterion that must be met in order to purchase a .ORG domain. "While we find the steady growth of .ORG in international markets promising, it's clear that more education needs to be done for both the .ORG and .NGO/.ONG domains," said Brian Cute, CEO of Public Interest Registry. "This research has been highly beneficial in guiding Public Interest Registry in certain markets. It has enabled us to better see where we need to focus our time and efforts over the next few years to grow .ORG and launch the new .NGO/.ONG domains." Local Time: Monday, April 22, 2019 09:55 AM PDT – Page Load: 0.3311 Sec.